SkinB5 is truly one innovative acne control system that will give you beautiful, clear skin to bring out your most confident self yet! Is your acne causing you trouble? Clear skin is an asset anyone wants to have. Some are blessed with blemish-free skin, but for those who are constantly on a battle with pimples, the search for the best acne fighting weapons is endless. SkinB5 puts an end to your quest as it claims to banish acne into existence! 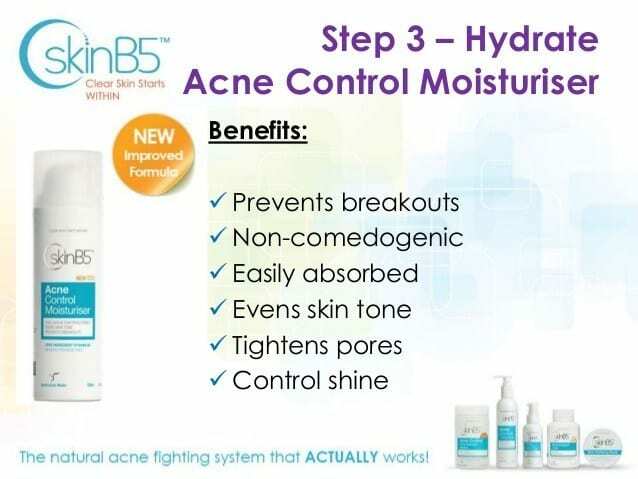 SkinB5 is an Australian 4-step natural acne-fighting system with a goal of helping people get “clear skin from within” for flawless-looking skin. It’s an advance formula that controls skin oil, prevents acne breakouts and efficiently stops acne before it starts (even blackheads). This acne solution comes in liquid and capsule forms, and can be used both on your face and body. PLUS! They also have a 5-Min Skin Purifying Mask that's dubbed as the “Best New Face Mask” as it supports and boosts the performance and results of the SkinB5 acne control products. Vitamin B5 is SkinB5’s main ingredient which is proven to increase skin health and ease acne by controlling the skin oil and sebum production. It is water soluble, so if it isn’t distributed to the body properly, it will pass right through and be wasted. 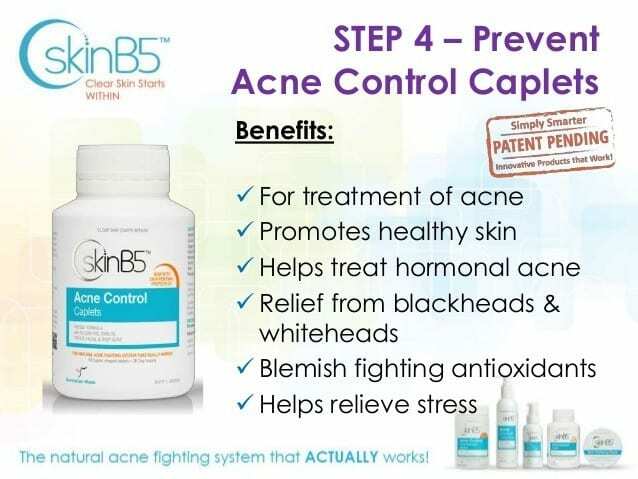 You may visit this page for a more thorough explanation on SkinB5’s acne control system ingredients. For acne treatment: Take 2 tablets 3 times a day. Take with food and water. For maintenance of healthy skin: Take 2 tablets 2 times a day. Take with food and water. Apply with water and massage gently into the skin (covering every area). Wash thoroughly with lukewarm water. Use twice (2) a day and sparingly to avoid skin irritation. Use twice (2) a day after using Acne Control Cleanser. Massage into the skin in small circles until thoroughly absorbed. Apply sparingly. 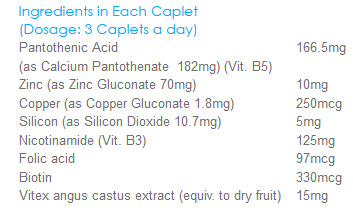 For maintenance of healthy skin: Take 1 caplet thrice daily along with food and water. Taking vitamin B5 in high doses may cause negative side effects such as heartburn, nausea, swelling of joints and depression. 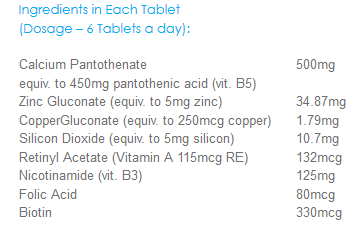 BUT, the SkinB5 range is well within safe limits of vitamin B5 usage making the products safe to use. Considering the impressive and clinically proven ingredients plus thousands of satisfied SkinB5 users from all over the globe, I’d have to say SkinB5 is truly one innovative acne control system that will give you beautiful, clear skin to bring out your most confident self yet! Don’t miss out on the wonderful benefits it can offer and get your own SkinB5 set now! Have you tried SkinB5? If yes, don't forget to leave your own review below. Honestly one of the worst and most expensive products I’ve used. 23 year old male struggling with hormonal acne. I’ve been using skinb5 for 2 months now (over $300 spent on 2 deluxe packages) and I’ve been breaking out more, even worse they’re cystic acne. 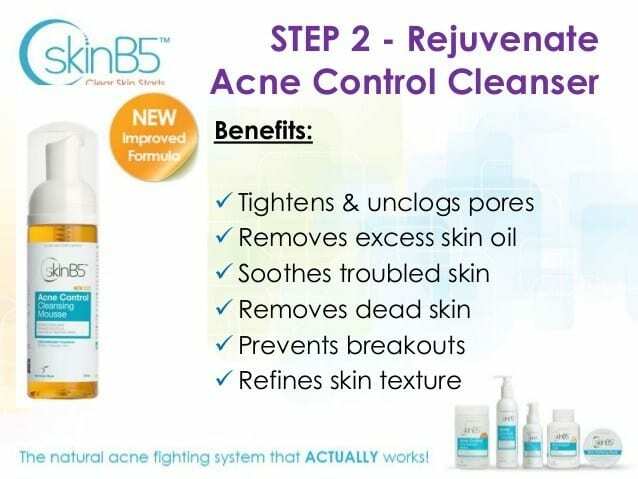 Apparently treatment starts to work 8-10 weeks skinb5 claims to reduce oily skin and to reduce acne, it hasn’t done either. I’ve been taking the pills, washing + moisturising my face on the regular (twice a day) and use the mask 3 times a week, exactly following their protocol. I’ve changed my lifestyle to cure my acne, I avoid dairy, greasy foods, only drink water, cut off protein sups, dont see what im doing wrong.. Lastly their customer service is pretty much copy and paste, I’ve written to them twice receiving the exact same message, “it’ll take 8-10 weeks for your body to absorb the nutrients.” just another marketing scam to make you buy more. Bottom line if you think you’ve tried everything under the sun then don’t think skinb5 is going to cure your acne. You’re better off investing your money into a proven regime (probably won’t be natural) or something that has a refund policy. My daughter has been suffering teenage acne and perioral dermatitis (chin) for 2 years. She has been a user of the SkinB5 extra strength tables for a period of two weeks & the difference is remarkable already. We noticed her skin begonning to look noticeably clearer in 5 days of use. Addium: Is this Brain Pill Really Worth Adding to Your Bodybuilding Checklist?